Why don’t you choose a more unusual but very exotic Asian destination for your next vacation? Book our freshly found New York to Hanoi flight for $900 r/t with taxes and fees included and spend an amazing week in Vietnam. If you fly with Eva Air in early December you will get your ticket for nearly $100 less than with all the other companies we have found. Our deal hunters have found the Hanoi flight on Travelgrove but it was provided by FlightHub. Check these and some other providers as well to make sure that you are booking the best fare. Depart on this Eva Air flight from John F. Kennedy International Airport (JFK) on December 6 and fly back from Noi Bai International Airport (HAN) on December 13. The flight has got a 4 hour stop in Taipei on the way to Vietnam and a 3 hour 25 minute one on the way back to the United States. 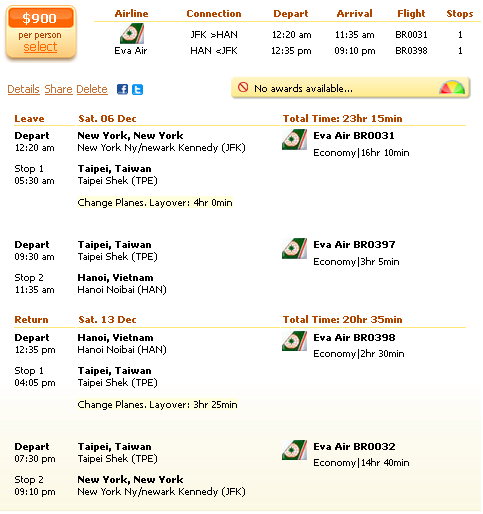 If you book this Eva Air flight deal you will save nearly $100 on your ticket from New York to Hanoi in comparison with the next best offer we found. As you can see in the table that is an All Nippon fare for $995 r/t. This entry was posted on Sunday, November 16th, 2014 at 2:03 pm and is filed under Airfare Deals. You can follow any responses to this entry through the RSS 2.0 feed. You can leave a response, or trackback from your own site.